According to a report by news agency Reuters, GE Renewable Energy CEO Jerome Pecresse told reporters in Paris: "We have the ambition to become one of the three major players in the offshore wind market." Pecresse also said that the company was looking at "the evolution of Adwen's capital with interest", reported Reuters, and that one large French offshore manufacturer makes more sense than several smaller ones. GE Renewables was formed last year after the US conglomerate bought Alstom's power and grid business, including an offshore wind division and its 6MW Haliade turbine. 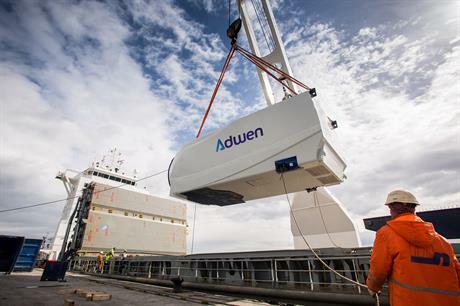 Adwen – formed in 2015 – has a portfolio comprising two 5MW platforms and is developing an 8MW platform. It has a commitment to build two factories in France to supply the 8MW nacelles and blades for French offshore projects totalling nearly 1.5GW. Should GE follow through with the takeover of Adwen it would become a major player with Siemens and MHI Vestas in the offshore market. The move could also allow Siemens to complete its proposed takeover of Spanish OEM Gamesa. Talks between the two manufacturers have been ongoing since late January, and it is believed Gamesa's part in the offshore JV Adwen has been a sticking point in the negotiations. Siemens is already the largest offshore wind turbine supplier in the world and is not interested in taking on its rival, according to reports.